Blokhead is a… well, thing with a block as a head that is used to deflect balls and break blocks in this freeware platform game. 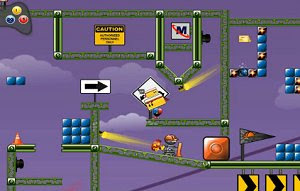 Blokhead was developed in three months by a team of four from the Vancouver Film School using the Unity engine. This is a fun and clever platformer that adds the breakout concept to the mix, resulting in an original game that requires some skill to progress through the levels. There are different types of balls to add an additional layer to the gameplay.